We are proud to offer you the option of having a personalized mold made for your business. Chocolate business card bars are a tasty way to get clients to remember you! The tooling cost to have the mold made is a one-time charge of approximately $160.00, depending on the detail of your pattern. One-cavity plastic molds cost around $5.00 each and we will need about 12 molds depending on the quality and time frame you request. This is also just a one-time charge. To get the molds made we need black and white camera-ready art of your logo in eps or vector pdf format. It takes approximately six weeks to have a mold made, plus additional time for us to craft your chocolate once we receive the molds. We would love to help you create these exciting and tasty marketing tools! 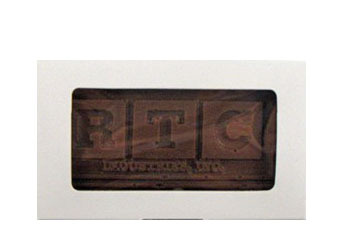 Chocolate Business Card - 1.5 oz. Corporate Box - 11.5 oz.